From renovations to walkable neighborhoods, here's what boomers want now. Many boomers want to move to a smaller house or a less-expensive neighborhood to free up cash for other retirement priorities. Many baby boomers say they want to retire to the Sunbelt. Most of the rest of us – those who have recently retired or who are planning to retire – want to stay closer to home. (There are always a few who go against the grain and plan to retire in Minnesota or Maine.) But even homebodies expect that they’ll likely sell their old suburban home and move to new quarters, which may be less expensive, more comfortable and more appropriate for their new stage of life as retired empty nesters. 1. Boomers want to pay off their mortgage. Most baby boomers, especially older boomers born before 1955, own their own home. They’ve been paying a mortgage, faithfully and relentlessly, for most of their adult lives. For these people, a primary goal is to finally pay off the mortgage and own their home free and clear. For many, paying off the mortgage is an important threshold – a crucial step they feel they need to take before they can even consider retirement. 2. They want to lower their housing expenses. It’s not just the mortgage. For many boomers, the equity they’ve built up in their home is the largest asset they have. According to a recent Merrill Lynch survey of 6,000 adults, on average, home equity among homeowners age 65 and older is more than $200,000. Many boomers look forward to moving to a smaller house or a less-expensive neighborhood to free up some of their equity to pay for travel, medical expenses, home renovations or other “extra” expenses they know they’ll face at some point in the years ahead. 3. Boomers want more convenience. A smaller home sometimes means less maintenance, less work and less worry. But not always. Most boomers have “been there, done that” with older homes that have history and “character.” They want modern appliances, energy-efficient doors and windows, spacious kitchens, an open floor plan with lots of light and fresh, new décor. Boomers are done with the “shabby chic” look of the 1990s. And a lot of them, suffering from bad ankles, bad knees and bad hips, are opting for one-story housing. 4. They want a walkable neighborhood. Boomers have spent half their lives in the car, commuting to work and ferrying kids to soccer games and dance lessons. Now many are harking back to their earlier years when they lived on a block with a grocery store down the street and restaurant on the corner – except now it’s a health-food store down the street and a funky coffee emporium with Wi-Fi on the corner. 5. They want to renovate. Boomers are not shy about investing in their homes. In addition to adding comfort and style, they are also starting to make their homes more age-friendly. They don’t want to slip and fall, so they toss out the scatter rugs and instead install carpeting or wood floors; they bring in extra lighting to help them see better, and they are no longer are embarrassed when grab bars begin to make an appearance in their bathrooms. 6. Boomers want to remain on their own. According to the Merrill Lynch survey, only about 10 percent of baby boomers say they want to move to any kind of retirement or age-restricted community. They instead want to stay in their own homes, in their own neighborhood, with their own friends, and if they think they might need help with personal care – or if they need extended care – they’d prefer to get all those services at home. Getting married and own a house? Interesting trend. NAHB analysis of data from the Census Bureau’s American Community Survey shows that, despite popular belief, the geographic distribution of households headed by someone age 55 or older is fairly even across most of the country. 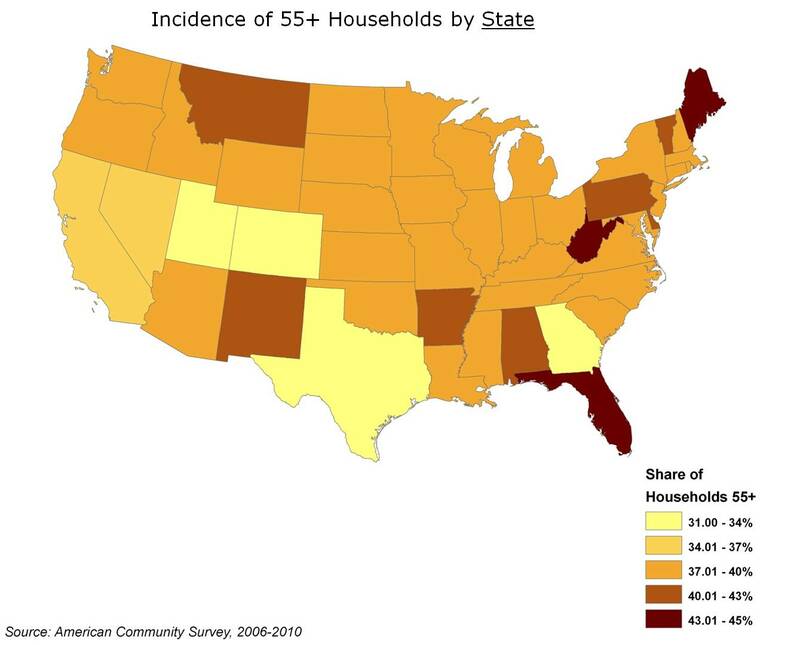 In every state, these 55+ households account for over 30 percent of all households. On a national level, 43.9 million households are headed by someone 55 years old or higher, accounting for nearly 38 percent of all U.S. households. Among the 50 states and the District of Columbia, the 55+ household share ranges from 31 to 45 percent. West Virginia tops all states, with 45 percent of its households headed by someone 55 or older, followed by Florida at 44 percent, Hawaii and Maine (each at 43 percent) and Pennsylvania and Montana (at 42 percent). At the other end of the scale, Utah and Alaska are the only states where less than one-third of the households are 55+. 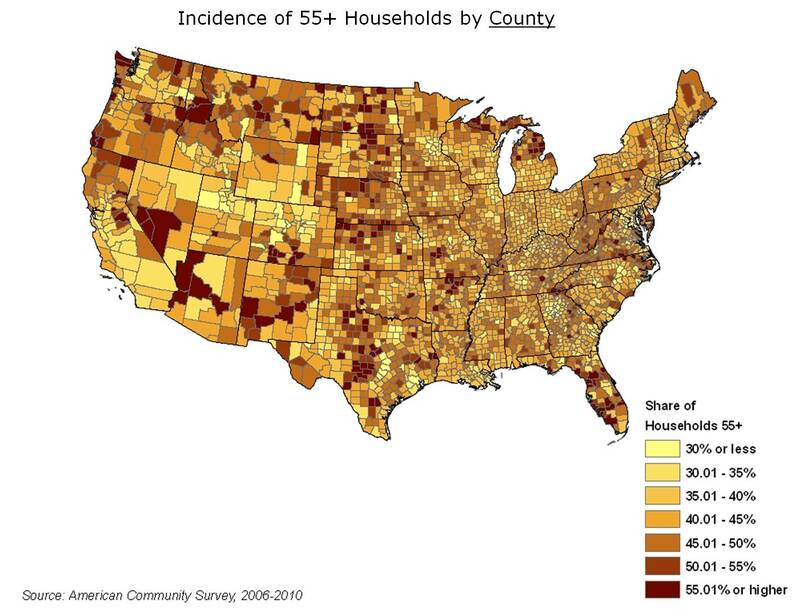 The 55+ household share is also over than 30 percent for 97 percent of the 3,143 county and county equivalents in the U.S. At the high end, 44 counties have a 55+ household share of over 60 percent. Mineral County, Colo., and Sumter County, Fla., are the highest ranked counties in the U.S. with 77 percent of their households headed by someone 55 or older. Sierra County, N.M., follows closely behind at 74 percent, while both Esmeralda County, Nev., and Wheeler County, Ore., come in at 71 percent each. Some of the extreme cases of “young” and “old” counties don’t contain many households, but there are five counties in Florida that have both a 55+ household share above 60% and more than 38,000 total households: Charlotte, Citrus, Highlands, Sarasota, and Sumter. For developers who may be looking for “exceptional” 55+ markets, these 5 counties in Florida form a distinct category. For tables showing the 55+ household share, as well as the number of 55+ owners, renters, and totals in each state and county, see thecomplete study.